But, as this article shows, the regime of Hugo Chavez was then riding high on the back soaring oil prices. There was no revolution in Venezuela. Being against neo-liberalism is not the same as opposing capitalism but only one form of it. However, it does feed into the social democratic narrative of Corbynism. Today, in the middle of an election campaign, the assertion that “Venezuela is socialist” is happily repeated by right wing papers and politicians to gloat over the social disaster which Venezuela has become. But this is a dangerous lie on all sides, as we pointed out in our article on the death of Chavez. Today, the global capitalist crisis has caught up with Venezuela and after three years of low oil prices the country is near bankruptcy. It will spend “almost as much servicing its debt this year, around $10 billion, as it will spend on non-oil imports, including food and medicines …” (Steve Johnson Financial Times 6 June, 2017). Ironically this comes from an article about Western investors (like Goldman Sachs) buying up Venezuelan government debt so they can make a profit out of any subsequent fear of default. Hardly a leap from capitalism to socialism. The consequences for the population are dire as the following article amply catalogues. The streets of Caracas are overflowing with tens of thousands of unemployed youths, slum-dwellers, students, petty bourgeois elements who are being turned into proletarians. While protests against the government multiply the police and army are being sent in to suppress everything. The clampdown has led to dozens of deaths amongst protesters and hundreds of arrests amongst the opposition. On the face of it, this is a "typical" clash between those in power and those out of power, so there is no need to know more: except that there are a number of aspects which make the Venezuelan tragedy more complex and difficult to read. Behind the Venezuelan civil war lies an economic crisis which in recent years has possibly hurt the oil producing countries more than others: these countries have built enormous wealth on this raw material, but without even minimally thinking about economic diversification. As soon as the oil price fell by more than 50%, the collapse of these economies was inevitable. Whilst Chavez enjoyed the period of high oil prices to make Venezuela one of the economically "emerging" countries, Maduro has had the bad luck of having to administer this second phase with all its attendant problems. Unemployment, although officially quite low at around 10%, is on the rise. At 800%, inflation wipes out the wages of the employed, sidelining consumer spending as wages are no longer paid or never collected. With the poverty rate already one of the highest in the world, the prospect of more drastic deterioration in the economy means an end to the little welfare that had been built in the golden age of oil dividends. As a result, the overwhelming majority of the population lives in fear of a future of even more poverty and insecurity. You could call it the offspring of the capitalist crisis. Instead, in Stalinist-Maoist and other leftist political circles, the cry has gone up to defend the “glorious” Bolivarian socialist experiment that was invented by Chavez and carried on by his heir-apparent, Maduro. They warn of counter-revolution in Venezuela, as if there had previously been a proletarian revolution to defend. They bewail a US plot to re-establish its dominant role in South America and to eliminate any socialist experience on the American sub-continent. We are now in the realm of the ridiculous, but some amongst the working class pretend it is nothing of the kind and take seriously the Stalino-Maoist anathemas which still infest the international proletarian political landscape. Of course, it’s true that US imperialism would be happy to be courted by a string of countries ranging from Honduras to Nicaragua, from Argentina to Brazil, through to Venezuela. And it is also the case that elements of the traditional bourgeoisie: private entrepreneurs, merchants, and petty bourgeoisie are lurking amongst the opposition to the Maduro government. They see a rightwing government as the best way of finding a way back into the arms of Uncle Sam: all part of the illusion that this would bring positive economic and political change. But the idea that this constitutes a capitalist conspiracy against Maduro's so-called socialist regime is laughable. There hasn’t been a socialist revolution in Venezuela. Chavez, good populist that he was, ushered in an absolutist political regime. He had attempted a couple of military coups that failed and when he finally got into power he executed a constitutional coup which allowed him to extend his presidency “until death do they part”, including extending power to his heir as befits a constitutional monarch, given that he had been the one who shaped the constitution. In terms of the economy, the Chavista regime has not even posed the problem of "mimicking" reforms to even give the appearance of beginning to transform capitalist production relations. On the contrary, political power, combined with the economic power that came from oil revenues, was used to strengthen every aspect of the capitalist economy: from extracting crude oil to its marketing and including the speculative use of a substantial portion of the oil revenue itself – all packaged into a type of state capitalism whose purpose was to continue to enjoy the oil annuity to perpetuate their hold on political power. The social progress flagged up by Chavez's regime never happened. The struggle against illiteracy and poverty, the elimination of violence in the big cities, the progressive dismantling of the terrible favelas, has_,_ for the most part, remained on paper. The little that was done has served only to retain a social base amongst the tens of millions of desperate people who cling on to the false hope that his programme will bring, if not salvation, at least a little improvement. The programme, which led to his re-election, had to concede a few drops of the oil revenue to popular illusions while all the rest went to the government apparatus, to the enrichment of a new state bourgeoisie, to the most audacious financial speculation as in any other capitalist country, except that it doesn’t occur to the rest of them to call it a "socialist experiment". When the price of crude dropped dramatically the shortcomings of the regime were revealed in terms of school education, healthcare and the fight against poverty. "The JM de los Ríos Children's Hospital in Caracas, which had been the pride of the country as a model of pediatric care in Venezuela, is today a tragic symbol of the crisis in this Latin America country. Half the gigantic building is falling apart, the walls are flaking, the floors are flooded and the rooms are so bad that they are no longer used. In the half of the hospital still operating, hundreds of children are being treated. But without much-needed medicine, as well basic medical supplies, and mothers have already given up asking for them. The shortage of medical resources is only one aspect of the deep humanitarian crisis that has devoured Venezuela for three years. This tragedy could have been avoided. For years the country enjoyed the prosperity of one of the world's largest oil reserves. But the sudden fall in the price of oil has exposed a reality that makes your blood freeze: the Venezuelan government had forgotten to invest in infrastructure. A country that used to import everything from food to medicines can no longer afford antibiotics. Venezuela also has one of the highest homicide rates in the world. Doctors, faced with such a shortage, must improvise to save lives, as if they were working in a war zone. Private hospitals face similar challenges in finding essential medicines and supplies. The senior staff of the Concepción Palacios Maternity Hospital, the largest in the country, told us that in the first quarter of 2016, 101 newborn babies had died, double that in the same period of the previous year. In the same hospital, about 100 women had died in childbirth since the beginning of 2016. The absence of official statistics on deaths in hospitals shows that the government of President Nicolás Maduro refuses international aid at the same time that it blames this terrifying domestic reality on its enemies"
Under the Chavez regime, Venezuelan oil allowed relatively large amounts of capital to be accumulated, but without bringing even medium-sized industrial development. Instead, a few crumbs were given to the "little people" to ensure their electoral support, whilst oil revenue enriched the "state nomenklatura" of senior army officers, bankers, sovereign funds directors, as well as ministers of the economy and exchequer, and speculators of all kinds linked to the regime. Between 2003 and 2013, well over $180 billion flew out of Venezuela to take refuge in speculation "made in the USA". The scandal of the structured bonds which was the basis of this capital flight, the fruit of fraudulent management of the oil revenue, was covered up by state bodies, out of sight of the due legal process. The scandal was minimised in the eyes of public opinion by the mild condemnation of it as a single rogue episode, and no-one was ever prosecuted. Nor was the social cost of this speculative movement to the state as a whole, revealed. So the experience of the "Bolivarian Road to Socialism" is the umpteenth bitter pill that the Venezuelan proletariat has had to swallow. It is the heir of, and accomplice to, that old, but rotten environment of Stalinism and Maoism which we referred to above. Despite the absence of any real working class reference point in today's China (just as in yesterday's we should make clear), the working class in Venezuela is worse off. Any talk of “socialism” as the fraudulent management of a state’s oil revenue entirely within capitalist economic categories, including speculation, means contributing to the political disarming of the masses to whom, instead, the deceit has to be unmasked. 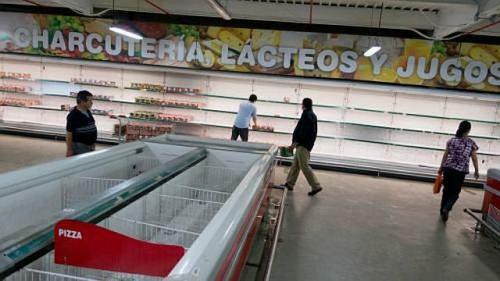 In fact, the crisis has laid bare the fake scenario of Venezuela. As soon as the easy capital ceased flowing the house of cards has miserably collapsed and the crumbs of welfare have given way to streets filled by desperate people in search of a less disastrous future. Rather than "defence of socialism" or "conspiracy against the revolutionary government of Maduro" it is necessary to forcefully condemn the deception which dragged in the masses and to clarify that the proletarian and communist revolution takes very different paths. What is happening in Venezuela has nothing to do with a revolution to support, or a "socialism" to defend. There is not even a framework for the much bandied about phrase of "poverty reduction." As we have written in previous articles, the feeble welfare provisions not only did not solve the problem of poverty but they did not even create the basis to begin to tackle it, both because they were just crumbs, and because they were only used as a one-off to win the electoral game. In fact we are faced with a real civil war (involving shootings) between a state bourgeoisie based on oil, which has ensured its economic and financial power through political control, but which is now being threatened by the social consequences of the crisis, and the old bourgeoisie which wants to return to power at all costs. The first defends its power in the name of a "fake socialism", the second in the name of a false democracy and freedom, that is to say, its ability to handle the current downturn in oil revenues. They are both turning to the proletariat, the workers, to the unemployed, as shock troops who can either bring them to power or keep them in power. It is the same old deception by the same old bourgeoisie who no longer have many cards left to play to keep the system going but they still find support from the "leftwing" of capitalism everywhere.